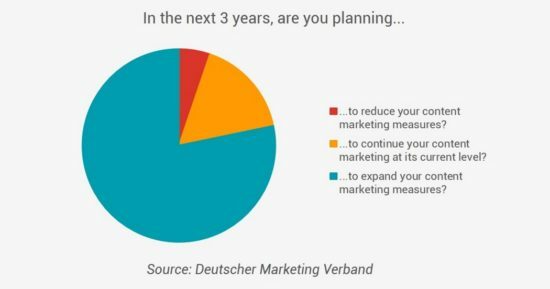 At the back end of last year, the German Marketing Association (DMV) published its Content Marketing Monitor to provide a statistical look behind the scenes at the state of content marketing in German businesses. 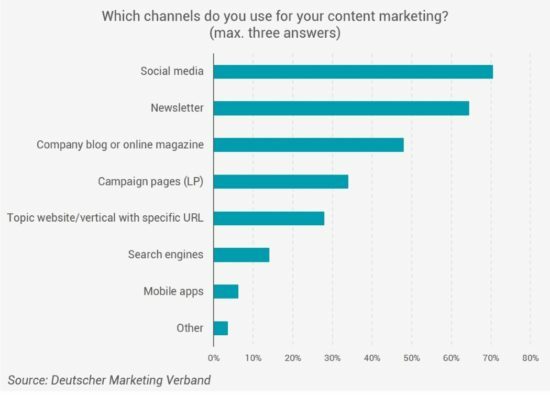 The results of the survey give us a wide-reaching picture of the current state of content marketing. 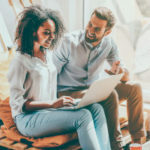 How do companies in 2019 view content marketing? How do they plan and structure their content marketing activities? We have looked through the results of the study and summarized the most important findings for you in this post. Find out about our content marketing services! In any industry, understanding the market is one of the first prerequisites for effective, demand-oriented product development and service positioning. 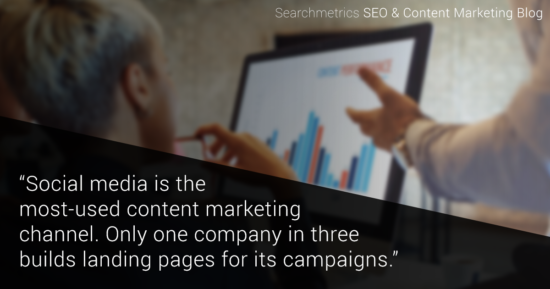 At Searchmetrics, this means that we need to understand SEOs and content marketers if we are to offer software and service solutions that address the problems they face. This is precisely the reason why we always work closely with our customers when we are developing our products and services. Their feedback is incorporated into our roadmaps and can, for example, be considered when iterating our software or when developing individual features. 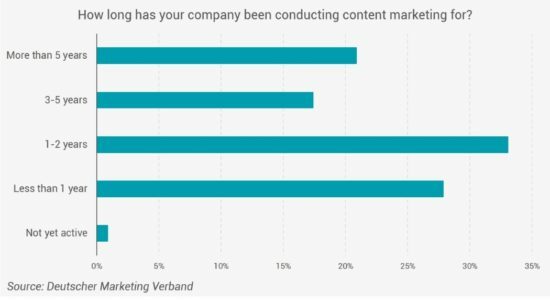 As well as this highly specific feedback, studies like the Content Marketing Monitor, published by the German Marketing Association (DMV) are valuable because they show us the big picture: How relevant do companies think content marketing is? Where is the industry headed? 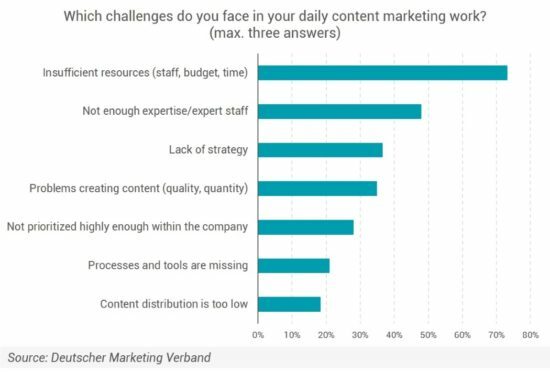 What are the largest challenges that are impacting the work of content marketers in 2019? 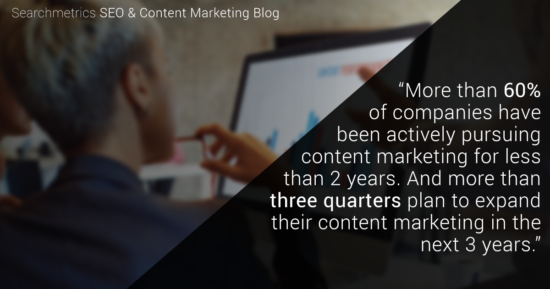 From the results of the Content Marketing Monitor, we can determine five key findings that show us the current state of the industry and how content marketing is likely to develop in the coming months. To help interpret the meaning of these trends, I am being ably supported in the upcoming sections by Michael Dziewior, Team Lead Content Services for the Searchmetrics Digital Strategies Group. Social media is the most commonly answer when companies are asked about their content markeing channels. 70% use platforms like Facebook, Twitter or Instagram to communicate their messages to their target audiences. At the same time, less than 50% build their own landing pages for content marketing campaigns. Social media does have clear advantages. This is where potential customers are already online and articles/posts have the potential to spread rapidly and generate enormous reach. But our impressions in social networks really as valuable as traffic on your own website? Of course not. 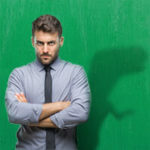 When calculating social media impressions, you are largely reliant on what the platforms tell you, and these cannot always be simply taken at face value. Visitors to a company’s own web presence show higher engagement and their user journey can be much better tracked and/or guided. On your own website, you have much more control and freedom e.g. regarding the analysis of analytics. It’s definitely the correct strategy to distribute content in the places where the target group is to be found. However, many companies forget that reach in social media doesn’t come for free. The days when you could just post something in Facebook and reach thousands of people are long behind us. Facebook hasn’t been a social network for a long time – it’s now an enormous advertising platform. The vast quantity of advertising is now discouraging more and more users, which is also reflected by an overall drop in user numbers. In 2019, companies should empancipate themselves from Facebook and look to diversify their touchpoints. Many companies have only recently started engaging with content marketing. More than 60% of survey participants have been conducting content marketing for less than two years. However, more than two thirds of companies want to expand their content marketing activities in the next few years. This means that the majority of companies are still getting to grips with content marketing, but the planned expansion shows that most recognize the potential these activities have and want to explore more possibilities. The biggest challenge will presumably be making the resources available that will be needed to push forward such developments. Content marketing is a means to and end. Before companies decide to start implementing content marketing activities, I recommend that they set up a clear strategy that supports the overarching marketing goals. Unfortunately, too many companies are still producing content for content’s sake – without any kind of strategy or goals. If you have the feeling that your marketing department would be able to do so much if only you had more resources, then it may be of some comfort to learn that you’re not alone. Almost 75% of the surveyed companies listed insufficient staff, budget and/or time as one of their daily content marketing challenges. So it’s not just you. After a lack of resources, most companies lack expertise (48%) and strategie (37%). Of course, these challenges are connected to one another. If you had more resources, you could hire experts and have them develop a strategy. Marketing executives who recognize this are certainly at and advantage. Otherwise companies run the risk of initiating measures without having developed a strategy for long-term success. As a rule, you are likely to get more budget if you can show that you are already using your existing resources effectively. If you are working efficiently with what you’ve got, and you can prove your success, then that’s the best possible argument for increasing investment. This is what makes measurability of content marketing so important for all marketers who want to continue to develop their activities in the future. We often see a lack of commitment from the management level, which is down to an inability to provide evidence for the success of activities. Regular monitoring and reporting based on pre-defined KPIs ist absolutely essential. It doesn’t just help you measure and communicate your success. It ultimately helps you gain more resources too. One question that many marketers probably ask who are not involved in content marketing, is what’s the point? 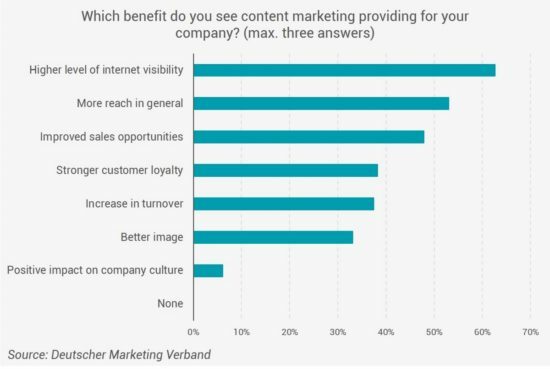 What benefits does content marketing actually bring for the company? The most common answer in the DMV’s survey was “higher level of internet visibility”. However, when we look at how success is measured, social media is out in front. 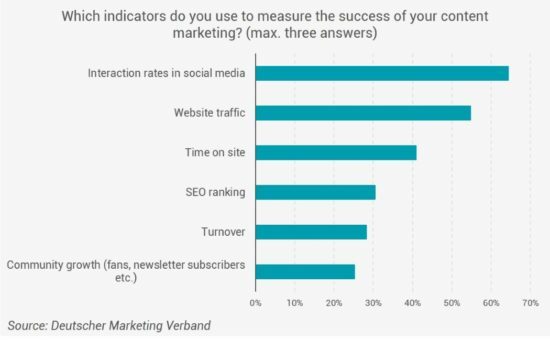 Almost two thirds of participating companies list interaction rates in social media (likes, retweets etc) as a measure of their content marketing success. This tallies, of course, with the fact that social media is the most-used channel. There is an obvious discrepancy here. Visibility in internet is not only – and in many cases not primarily – achieved by a social media presence. Visibility in Google can be considered much more important, as it is search engines that remain the largest source of website traffic – far ahead of click-throughs from social media. And yet, fewer than one company in three uses “SEO ranking” to measure their content marketing success. This would suggest that companies are missing out on a great area of potential that content marketing has to offer. If you are only investing in content marketing in order to generate likes, then you are ignoring many opportunities that could help contribute to your company’s actual business goals – goals like increased traffic, conversions and, ultimately, higher turnover. “Higher level of internet visibility“ is the most-frequently mentioned benefit of content marketing. Yet, the interaction rate in social media is most often used to measure success. This isn’t a surprise if we consider that the majority of companies are still relatively new to the content marketing business. But if they genuinely intend to ramp up their activities and use content marketing to increase their online visibility, then they should look closely at whether their current activities are really geared towards reaching this goal. The marketing goals of a business should always form the starting point for any content marketing strategy. This should form the foundation for the creation of specific KPIs for measures and touchpoints. Here, the message is the same: Emancipate yourself from Facebook, diversify your content distribution and define clear KPIs! 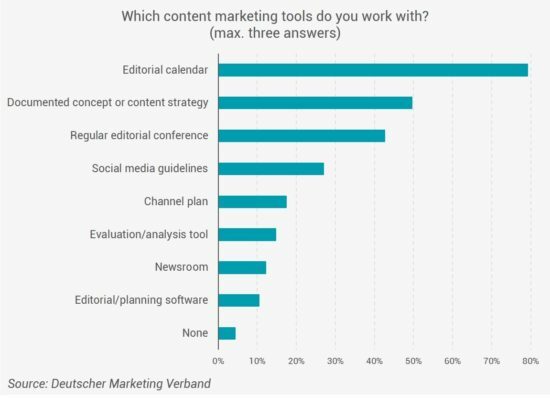 The German Marketing Association welcome the professionalization of content marketing within companies – almost 80% work with an editorial calendar. But what is an editorial calendar? This might be little more than an Excel sheet with a list of dates for blog and social media posts or recurring Outlook appointment for the newsletter? We see that only 10% work with an editorial/planning software solution and only 15% have a tool for analysis or evaluation. Wherever processes lack automization, there will also be a lack of scalability. This suggests that it will not all be plain sailing for all these companies who hope to expand their content marketing activities in the near future. Almost 80% of companies work with an editorial calendar. But only 10% use an editorial/planning software solution. From my point of view, many companies still fail to engage properly with monitoring and reporting. Publication is seen as project completion. 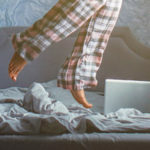 I see great potential for many content marketers to generate more awareness for the work of their departments – this does, however, require that their activities are comprehensively tracked across all touchpoints. 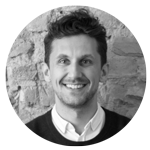 But don’t be put off by the initial complexity of setting this up – these are investments that will pay of in the long term and help you to scale up your team and your resources. When a department is young and small, or even consists of just one person, then there are many challenges to driving content marketing in a sensible, sustainable way. If this department is unable to provide hard, numbers-based evidence for its success, then it will be all the more difficult to receive an appropriate portion of the marketing budget. It is this that makes it so important to set up an effective content marketing strategy, scale activities and link them to goals, and ensure that success is measurable. This will ensure that you can prove the value of your investments. 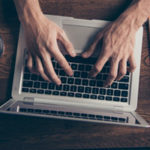 Content marketers who succeed in doing these things will be better placed to achieve recognition within a company, to grow and to increase professionalism within their departments. 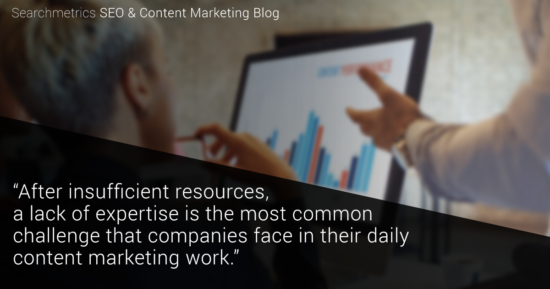 At the same time, CMOs who are quick to recognize the value of content marketing for their company, and who invest accordingly, will give their teams more opportunity to act strategically and sustainably. This will lay the foundation for more success that actively supports the company’s marketing and business goals. To see how successful companies are in doing this, we will have to wait for the results of future studies. You want to expand your content marketing activities? Then make an appointment to speak to one of the consultants from our Digital Strategies Group. 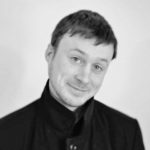 Voices of Search Episode 34: Is desktop more important than mobile?